Skin Renewal at Midwest Medical Specialists, P.A. comprises board-certified dermatologists and a facial plastic surgeon working with specially trained, licensed aestheticians. As a team, the Skin Renewal professionals are committed to providing you with a personal skin care program tailored to your skin concerns, life style, age, and budget. We will listen to your needs and work with you to develop an ongoing skin care regimen utilizing optimal treatments, procedures, rejuvenation products, and prescription medications. Profound is clinically proven to create 3 vital skin elements: elastin, collagen and hyaluronic acid. These major skin building blocks work to create dermal volume. Profound is the first device with temperature controlled radiofrequency clinically and scientifically proven to deliver energy directly to the deep dermis to stimulate neo-elastogenesis, neocollagenesis and hyaluronic acid deposition. Diamond microdermabrasion is a gentle technique designed to smooth and freshen the skin. It invigorates the skin, stimulates cell renewal and gives a healthy texture. It is also used for age spots, comedonal acne and fine wrinkles. Enhanced microdermabrasion simultaneously combines two treatments, such as medical microdermabrasion with glycolic peels, medical dermabrasion with Blu-U light, and the Swiss microdermabrasion utilizing Methode Physiodermie products. This is a desquamating technique which physically exfoliates the skin to diminish fine wrinkles and the appearance of dull, dry skin. It will also temporarily reduce fine, vellus facial hair. The Methode Physiodermie facial will nourish your skin with a combination of masks, cleansers and serums infused with botanical extracts and customized to meet your skin care needs. The treatment begins with a gentle cleansing massage and is followed by a chemical acid exfoliation. This treatment is helpful for congested pores and problem skin. We start with cleansing the upper back area, then detoxify, exfoliate and mask. This is a medium depth peel performed by an esthetician and is ideal for all skin types with mild to moderate signs of aging. This peel works to reduce the appearance of discoloration and uneven texture while improving dullness and clarity. To better maintain and enhance the results of peels and microdermabrasion, various products which can have a therapeutic effect (cosmeceuticals) and prescription medication may be recommended. 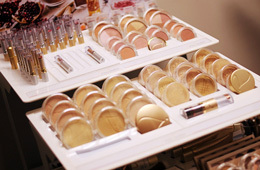 jane iredale Mineral Makeup™ provides a luminous complexion. Makeup lessons as well as consults are available. 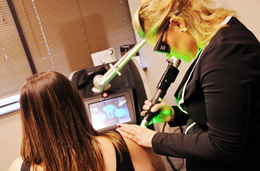 Laser hair removal requires a series of treatments to gradually reduce and eliminate unwanted facial and body hair. The treatments are spaced between four and six weeks. The hair must have pigment in order for the treatment to be successful. A non-ablative patented treatment for skin resurfacing, with high efficacy and little to no downtime. This procedure is used for the treatment of sun damage, melasma and acne scarring. A series of 4-6 treatments is recommended for best results. ALA is applied topically to the skin and is selectively absorbed into photodamaged skin, sebaceous glands (acne), hair follicles, and precancerous cells (actinic keratosis). The result is an improvement in the texture of skin, destruction of precancerous skin lesions and improvement in acne. ALA is a photosensitive topical medication that is applied to the skin and then exposed to Blu-U light. The treatment will improve inflammatory acne, treat precancerous cells, decrease oil production by the sebaceous glands, and improve skin texture. Consult with aesthetician screening and evaluation; 15 minutes. Full consultation and product evaluation. Professional consultation with a Physician of your choice. Botox injections are used to minimize and decrease fine lines, creases and furrows, such as horizontal creases on the forehead, the furrows or “scowl lines” between the eyebrows or the crow’s feet around the eyes. Because there is discomfort with these injections, a numbing cream can be applied to the areas to be treated 30 minutes prior to the injections. A fuller and rounded face is the hallmark of youth. As we get older, we lose the fullness of our face as skin, collagen and even muscle and bone are resorbed. Hollowness may develop in our cheeks and temples, and eyes may appear sunken. Deeper folds appear around the mouth as the tissue gets resorbed and can no longer hold up the weight of the cheeks. Different types of injectable gels have been developed to counteract these changes. This is a non-surgical in-office treatment. Usually one to two syringes of filler are needed per treatment. Fillers are also used to fill the fine lines around the lips and eyes to give fuller lips. Juvéderm injectable gel replaces the hyaluronic acid that your skin has lost over time and brings back its volume by smoothing away facial wrinkles and folds. Juvéderm is indicated for correction of moderate to severe facial wrinkles and nasolabial folds. Juvéderm has a wonderful consistency and is the only hyaluronic acid filler that is FDA-approved to last up to one year. Radiesse is a dermal filler that contains unique calcium-based microspheres that stimulate the body to produce new collagen. It goes beyond filling and correcting facial wrinkles and folds by restoring facial volume. Radiesse provides immediate, natural-looking results that may last a year or more in many patients. Belotero is a hyaluronic-based filler that is FDA-approved for injection into the superficial skin. It is a soft gel for the correction of very fine lines. It allows improvement of the lip line without distorting volume or proportion. Belotero can last up to six months or more. Approved by the FDA, Juvéderm Voluma is a hyaluronic acid used as injectable facial filler. It temporarily restores volume to the mid-face. That means filling out those wrinkles around your nose and on your cheeks. Facial restructuring with fat is a process in which fat is harvested from one area of the body by liposuction and transferred to another, where it is injected into facial muscles and below the skin to give an enhanced, fuller, more youthful appearance. Usually the fat is taken from the thighs and the abdomen. Results may last as long as five years. There is some evidence that multipotential cells in the fat may stimulate the redevelopment of shrunken muscles and dermis. Consultation for this procedure is with Dr. Frank Koranda.